Selecting the right font for use in print is somewhat a challenging task. Print fonts should be concise, smooth, and be able to hold its own ground without extra help of other fonts. 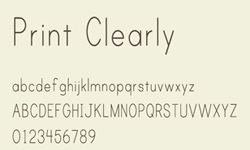 Many times Serif font is the obvious choice for designers. Although there are a few similar fonts that can be used for web and print, the list we’ve compiled below for most effective in print. Here we’ve picked a variety of famous and a few incomprehensible fonts that we believe do a good job of conveying readability when used for print. Have we missed any other fonts? Let us know in your comment!